AGITATOR DRIVE MOTOR, 120V, 60HZ, 45 RPM, INCLUDES FAN BLADE STAR POPCORN MACHINE G8, G8AT, G12, G12AT, G14, G14AT, G18, G18AT. OEM Numbers are used for reference only, see Policies for more details. 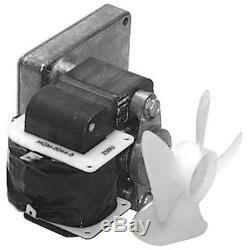 The item "DRIVE MOTOR AGITATOR 120V 60HZ 45RPM WithFan Blade for Star Popcorn Machine 681199" is in sale since Thursday, October 4, 2012. This item is in the category "Business & Industrial\Restaurant & Food Service\Commercial Kitchen Equipment\Cooking & Warming Equipment\Parts & Accessories". The seller is "restaurantparts" and is located in Silverthorne, Colorado. This item can be shipped worldwide. Model: G8, G8AT, G12, G12AT, G14, G14AT, G18, G18AT.